A rising trend among corporations today is to engage in skill-based volunteering. This model has long been used on a smaller scale with graduate students who serve as interns or fellows. The students come to the nonprofit with a designated project and spend a semester or more addressing it. The students are chosen because their skill set matches the nonprofit need. Now corporate philanthropy is taking this idea to a larger level, aiming to create long lasting and potentially transformational partnerships while giving nonprofits the potential to have sophisticated infrastructure otherwise unavailable with their limited staff and budget restraints. This is not just pro bono volunteering, but customized volunteering. Des Moines’ annual DSMhack bringing together skilled volunteers from across the IT spectrum, creating new websites, mapping tools and even a nutrition calculator for worthy nonprofits–all in one fast paced weekend! In order to work the process must start with a nonprofit’s needs, then match those needs with a corporate partner having a focus and skill set that meets them. Additionally, the nonprofit must have the staff and capacity to invest in guiding and supervising the process, which can prove challenging. Sometimes referred to as ‘The Knitting Factor’, skill-based volunteering is designed with a focus on long term training, long term connection and long-term effect. With 75% of corporations incorporating employee citizenship activities into their model and since, from the corporate perspective, skills-based volunteering has been found to enhance employee skills and talents, improve retention, and is attractive to millennials, this idea is likely to grow! AUSTIN, Texas—Does your Central Texas company have a philanthropic/giving budget? How do you engage your employees in philanthropy? And which causes is your organization most likely to support? New data from the 2018 survey will be compared to previous findings, illustrating trends in local corporate giving and employee engagement. Who spearheads giving: Last year’s study found that philanthropic/giving efforts are most often spearheaded by ownership (43 percent) or directors/executives (24 percent). What they donate: Monetary donations led the list, but there are other significant ways that companies contribute. Many companies allow their employees to take volunteer hours (73 percent) as a way to support nonprofits. Certain causes generate the most support: Most companies cited education (70 percent), human services (58 percent) and health and wellness (55 percent) as the types of causes they support. Every year, the survey asks new questions and widens the scope of the Rodman Report, which was first published in 2015. In an email message to area business leaders last year inviting them to participate in the survey, Austin Mayor Steve Adler wrote that “we need your help to continue measuring and communicating” how local organizations are charitable force for good. “Please help us grow this study as it continues to be an enlightening measurement for businesses, nonprofits, community leaders, and all of us as charitable givers,” Adler wrote. The 10-minute survey is hosted on SurveyMonkey.com and is available at bit.ly/2018RodmanSurvey. Those who take the survey and opt-in to receive a digital copy of the Rodman Report will have an opportunity to get a first look at the survey results. The Survey of Corporate Giving and the Rodman Report were created by Austin’s Rodman & Associates. Last year’s “2017 Rodman Report” contains insights on philanthropy at Central Texas businesses. Download the report (in PDF) at RodmanReport.com. A March 14 article in the Austin American-Statesman touts the results of the Rodman Report, providing a rundown of its key findings and gaining insight from two businesses that participated in the Survey of Corporate Giving. Williams interviewed Steve Simmons, business development director for Amy’s Ice Creams, and Greg Pierce, owner and founder of Zuma Office Supply. Both companies were represented in the survey, and both Simmons and Pierce discussed how the ways that they support local charities and engage their employees in those efforts. Who spearheads giving. To find the decision-makers, start at the top of a company’s flowchart. In 44 percent of companies, owners or executives drive philanthropic efforts. In most other cases, efforts are led by directors/executives (17 percent), marketing/public relations (14 percent) or are employee-driven (12 percent). What they donate. Monetary donations (80 percent) still lead the list, but there are other significant ways that companies contribute. Many companies allow their employees to take volunteer hours (73 percent) as a way to support nonprofits. The causes they support. For the third year in a row, companies were most likely to cite education (70 percent), human services (58 percent) and health and wellness (55) percent as the types of causes they support. The study is endorsed by Austin Mayor Steve Adler, who provided an invitation message to business owners encouraging them to participate in the survey. Austin City Council Member Alison Alter, who is also a philanthropic adviser, supports the initiative, as well. Alter noted that nearly all of the companies surveyed said they give back in some way, and a majority of them have a giving budget that grew over the last year. Download the 2017 Rodman Report. Who spearheads giving: To find the decision-makers, start at the top of a company’s flowchart. What they donate: Monetary donations still lead the list, but there are other significant ways that companies contribute. The causes they support: Nonprofits focused on education, human services, and health & wellness are most likely to get companies’ support. 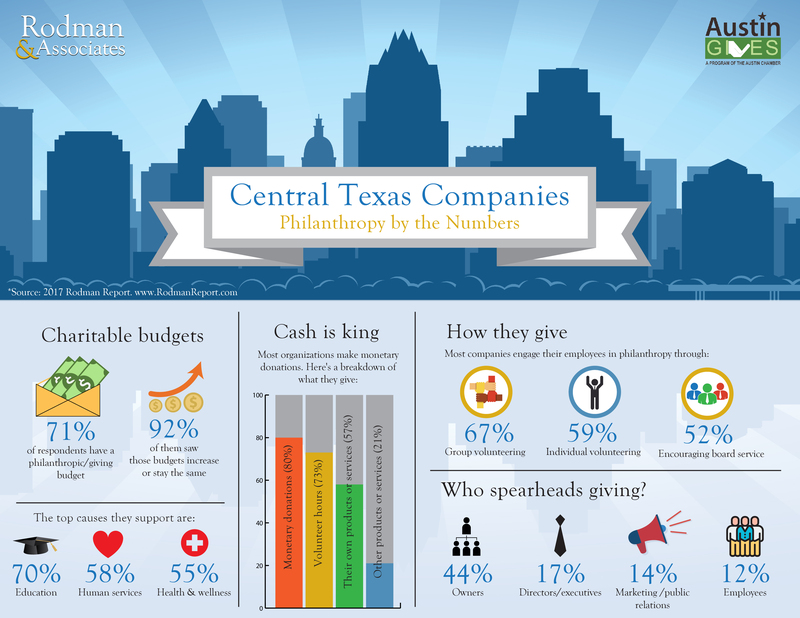 Central Texas Companies: Philanthropy by the Numbers illustrates these and other key metrics. We invite you to share the infographic with colleagues and employees by posting it to your website or blog, and/or including it in employee newsletters and other communications. For questions or assistance with using this infographic, email scott@pattersonhughes.com. The full Rodman Report will be available for download the week of March 6. Make sure to visit RodmanReport.com at that time to get your digital copy! Austin is a vibrant, thriving city comprised of people who put their caring into action by enthusiastically supporting charities and nonprofits. I’m proud to say that our business community reflects these values, with results from last year’s Survey of Corporate Giving in Central Texas showing that most local companies have a philanthropic/giving budget, and the majority of those budgets increased from the previous year. The Survey of Corporate Giving is an annual project, and we need your help to continue measuring and communicating how businesses in Austin are a charitable force for good. This year’s survey takes 10 minutes to complete, the results are anonymous, and the findings will be published in the 2017 Rodman Report. What has changed since last year? What new trends will we discover? The 2016 Rodman Report revealed, for example, that 77 percent of companies engage employees through group volunteering – a great way to increase employee morale. Once again, I would like to thank Austin Gives™, a program of the Greater Austin Chamber of Commerce, for partnering in the effort to share the Survey of Corporate Giving with local companies. Please help us grow this study as it continues to be an enlightening measurement for businesses, nonprofits, community leaders, and all of us as charitable givers. By taking the survey today, you will be signed up to receive a free digital copy of the 2017 Rodman Report when it is published in March. Let’s keep proudly telling the world how businesses in Austin and our surrounding community are giving back. Thank you for taking the time to participate in the Survey of Corporate Giving.